Even with loads of free-to-play elements, EA's puzzle riff is a smoother, friendlier experience. Currents shift certain gems around a rotating path in some stages—plus you’ve got butterflies to contend with. Bejeweled is an absolute classic in the match-three puzzle genre, and developer PopCap is a casual gaming legend for that series, Peggle, Plants vs Zombies, and other alluring creations. But in recent years, the dominant mobile puzzle experience has been Candy Crush Saga, with its grids of colorful candy icons, the limited moves allowed to solve each puzzle, and the myriad premium power-ups dangled in your face. The number of Candy Crush clones on the App Store is truly nauseating—and nothing makes my eyes roll harder than getting a PR pitch on an “innovative” or “creative” new puzzler that just copies King’s successful formula. With that in mind, Bejeweled Stars isn’t all that innovative, as the core design takes after Candy Crush and it’s a freemium experience through and through. But PopCap’s latest Bejeweled spinoff does put some creative tweaks on the familiar formula, plus it’s ultra-polished and has a much friendlier ramp-up than any Candy Crush game to date. In fact, I’d say it’s the best Candy Crush-esque puzzler around for anyone who is new to the game style—or was scared off by earlier attempts. Truly, Bejeweled Stars is much more a freemium Candy Crush experience than a classic Bejeweled one, which seems to be baffling some early App Store reviewers. In every level, you get a new grid of gems to clear in like-colored lines of three or more, four-piece squares, or five-piece L shapes, and you must complete the objective within the provided number of moves. Otherwise, it’s game over—or pay to continue. Cloud chunks can be dragged and dropped between locations, letting you advantageously shift gems as needed. Other aspects are familiar, too, such as needing to clear gems over certain spaces on the board, as well as earning special explosive pieces for larger gem pairings. And there are stone tiles that can only be cleared by detonating those special gems nearby, which adds a bit of location strategy into the mix. But while all that stuff is tried-and-true, PopCap’s various additions help liven up the experience. For example, you’ll quickly encounter stages that feature moving currents of gems, with the river shifting all of the floating gems one space after each move. Elsewhere, there are parts of the board on clouds that you can move between multiple spots—which brings those gems along with, which adds another consideration. And you might need to rescue butterfly gems that climb up the board with each new move; letting one escape ends your game. These elements can complicate the core match-three experience a bit, especially once the game starts stacking objectives—for example, clear a certain number of stone tiles while also rescuing butterflies. But surprisingly, Bejeweled Stars has one of the smoothest difficulty curves I’ve seen on a game like this. I ran through more than 20 stages before I even felt lightly challenged, and then it was many more stages before I had to play one multiple times to continue. Contrast that to Candy Crush Jelly Saga, in which the 20th level felt like an impenetrable brick wall; certainly not the first time I’ve felt totally stymied by a Candy Crush game and pushed to spend money on continues and power-ups. Bejeweled Stars hasn’t nudged me to that point after finishing about 50 stages so far, but it certainly has its freemium hooks. Bejeweled Stars has power-ups, but they’re crafted using earned gems rather than simply purchased. 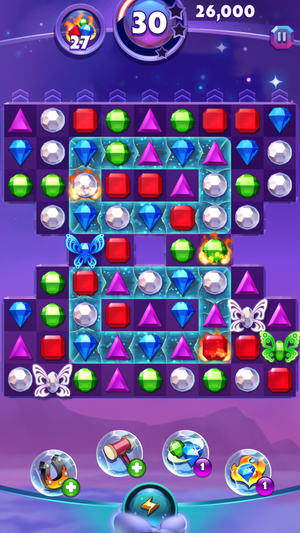 Like most free-to-play puzzlers, Bejeweled Stars has an energy system that allots five hearts to use at any given time, with one burned up with each level loss. 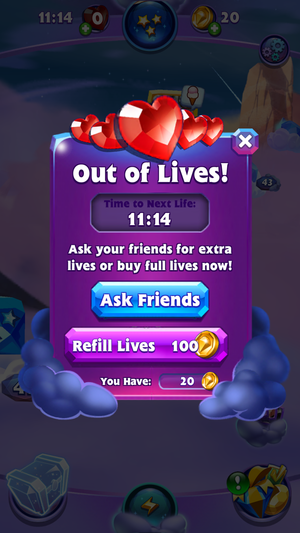 Each heart regenerates in 20 minutes apiece, or you can pay in-game coins to refill the whole bar immediately if you’re in the middle of an extended play session. Coins are also used for continues, letting you buy five extra moves at the end of a stage. 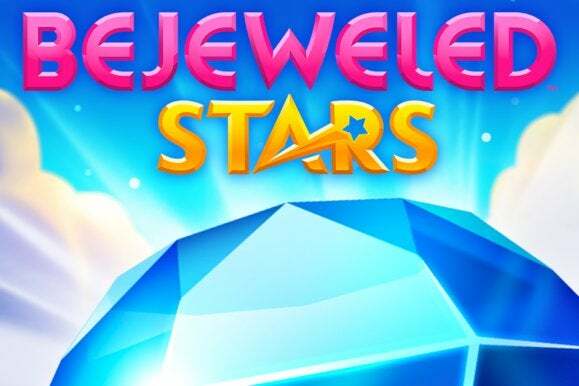 Bejeweled Stars has power-ups, but unlike Candy Crush—which gives you a couple of each to try and then tempts you to buy any further items—you can craft these using gems earned through play. Each takes a while to finish crafting, ranging from 15 minutes to 4 hours, and your crafting station can only tackle one project at a time. Naturally, you can pay coins to speed up that ticking timer, or even to buy any gems needed for a particular item recipe. Bugging a Facebook buddy for lives is a drag, but so is spending about $2 worth of coins. Which can you live with more? Elsewhere, the game provides free treasure chests that unlock a few hours after you complete a stage, and you can pay coins to change the rarity of the chest, hoping to end up with a better haul in the process. You can also buy chests outright from the same store that sells coin packs. Stars also awards a free daily golden egg from a goofy cartoon chicken, which can earn you gems, plus you can craft additional feed tokens to gain even more rewards. In short, there are a lot of ways you can spend coins in Bejeweled Stars, and EA won’t bat an eye at selling you large bundles of them: You can get 110 coins for $2 ranging up to 3,350 coins for $50. Continuing a level costs 50 coins while a full energy bar refill is 100, so you can get a sense of how much each task would cost you in real money if you choose to partake. What strikes me about all of those coin requests is that while plentiful, none feel especially crucial. Even more so than Candy Crush, you can make consistent progress in Bejeweled Stars if you play in short bursts and don’t let irritation push you towards pulling out your wallet. Frankly, Stars doesn’t have a lot of truly frustrating moments, at least not in the first 50-or-so levels, although I’m sure the later play does continue to gradually increase the challenge. 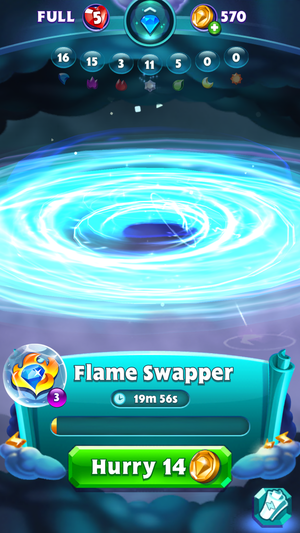 Just to see how it played a role, I spent $10 on a pack of 575 coins, which made me more likely to splash some coins for a continue when I was a few moves away from winning a stage, or pay for an energy refill rather than wait out the recharge or bother my Facebook friends. 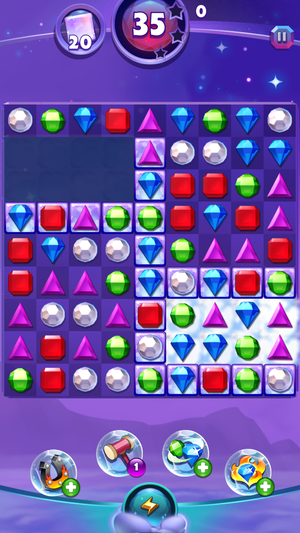 But really, I could have done without the in-app purchase: Bejeweled Stars may not be a complete evolution of this particular style of match-three puzzler, but it finds a better balance between fun and frustration than the genre’s lead franchise. PopCap has stumbled in this space before, as last year’s Peggle Blast showed, but those problems aren’t so prevalent here. Between the fun gameplay tweaks, glossy graphics, peppy atmosphere, and the more gradual learning curve, Bejeweled Stars sees PopCap creating the definitive version of the Candy Crush formula. If we’re all lucky, more developers will learn from this kinder, friendlier approach to free-to-play puzzle design rather than the frustrating difficulty walls and aggressive monetization push seen in many contemporaries.